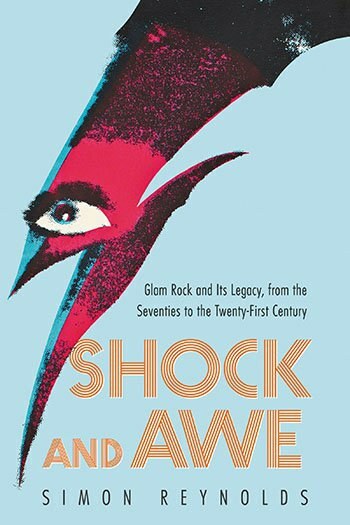 Simon Reynold's Shock and Awe is a thorough investigation into the many facets of rock's most maligned moniker. To hear Simon Reynolds tell it, rock 'n' roll will never die, and glam is the reason. The handful of books authored by Reynolds are each excellent in their own way, and collectively showcase a personality whose flexibility of mind has allowed him to keep a finger on the pulse of modern music for nearly 30 years. Now in his 50, Reynolds began at Oxford and then worked for Melody Maker in the late '80s where he dove deeply into hip-hop and the edges of whatever experimental rock music had not been sucked up into the vacuum of pop. He spent the early '90s in New York, freelancing and capturing the rave scene. After smartly marrying Joy Press, former editor of the Village Voice literary supplement and current culture editor for Salon.com, they co-authored a book on gender in rock music that established both of them as responsible purveyors of that fine blend of cultural critique and music journalism that has ultimately become the standard for how we conduct a scholarly analysis of music today. His work has had Faber and Faber’s vote of confidence, with which he’s continued to publish astute analyses of diverse musical genres and the challenge of music nostalgia itself. Rip It Up and Start Again: Postpunk 1978-1984 is closest in form and content to his newest work, Shock and Awe: Glam Rock and It’s Legacy, from the Seventies to the Twenty-First Century. Reynolds is skilled at jumping back and forth across the pond, translating uniquely British and American viewpoints or cultural frames of reference so that Shock and Awe truly encompasses a complete analysis of glam. Although the author is sitting on a wealth of theoretical academic underpinnings, never does Shock and Awe plumb the pedantic depths of Baudrillard or Butler when it could instead stay focused on the music. This book is laden with insight into the problem of persona in performance studies, the concerns of commodity fetishism, and the fluidity of gendered bodies, but Reynolds gloriously captures these academic debates without ever getting bogged down in their language. This book is equally parts theory and history. The historical information is presented as needed, for evidence in support of Reynolds’ analysis, as opposed to simply a chronological slog through a series of facts of which most fans of these bands will already be well aware. There's no great mystery revealed in any band’s biographical detailing, but Reynolds does a fair number of magic tricks in lining up the parallels and unveiling the threads that echo across the whole spectrum of glam. Yes, glam is a spectrum. It has an early period, a wide middle zone, a late period, and then modern music is shot through with its remnants. If we’re going to point a finger at just one artist who ran the whole gamut, that’s clearly David Bowie. Shock and Awe has 13 chapters. Bowie is the prominent figure considered in five of them. In the beginning, in London, there was T. Rex and the sparkly weirdness of Marc Bolan. Bowie was quickly nipping at his heels. Meanwhile, in the Arizona desert, Alice Cooper is beginning to take shape. The world over, teenagers are coming into their consciousness as a group identity with buying power. Glitter collided with disco, Slade and The Sweet collided with Suzi Quatro and Lou Reed. Does anyone remember Jobriath? The present held so much past and so much future, with Roxy Music and Bryan Ferry clearing space for glam to bleed into other art forms, delivering unto us the twin gods of John Waters and Andy Warhol. Is there anyone left on earth who can’t quote from The Rocky Horror Picture Show? Then there’s the baroque connection and a whiff of proto-punk ultra-violence. Eventually, we arrive at a modern cornucopia of rock stars with seemingly little in common other than this terrific throughput of glam: Johnny Rotten, Prince, Morrissey, Marilyn Manson, Lady Gaga, Beyonce, and on and on until what else but the death of Bowie. Chapter 13, this “Aftershocks” section examining new work outside of the time period of glam that nevertheless strongly expresses it as an influence, is written like a kind of journal. They are just notes and jottings about current events that involve glam personalities and happenings. Reynolds doesn't anoint the next god of glam -- in fact, he arrives at the conclusion that we don’t need one. What Bowie understood, in his many decades as a shapeshifter, was that the revolution can be individualized and personalized -- and then it can be commoditized, destined to circulate forever. Shock and Awe is a very interesting read. You can pick it up if you love Bowie, or if you love one or two bands that have ever even marginally been tagged as glam. It’s about being a weird kid and making it work for you, rather than against you. It’s about finding a home in ostracism and driving your enemies into a jealous rage. It’s a book about class warfare and corporate machinery, gender coding and sexual stigmatization, the politics of performance, and the ideological investments made by an audience of rock music fans. It’s about the fact that glam is very much alive in music today, and Reynolds makes inarguable the premise that glam is not only not an insult, but it's a powerful revolutionary strategy.